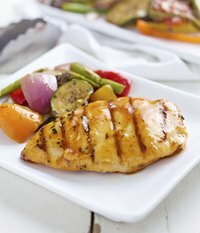 A glaze gives chicken a glossy, flavorful coating to complement the meat’s flavor and dress up its appearance. Most chicken glazes are thick and sweet with a citrus undertone, negating the need for a dipping sauce or dressing. Glazing chicken requires a little more effort than baking it normally, but will produce a significantly tastier dish. Melt equal parts butter and olive oil over medium heat in a large skillet. Place the chicken into the pan, browning both sides of the breast. Set the chicken aside. Combine 2 parts of orange or pineapple juice, 1 part dry white wine and one half part of honey in a saucepan. Season with freshly ground black pepper. Whisk the mixture for five minutes until the glaze thickens slightly. Submerge each chicken breast in the glaze before placing into a greased baking dish. Drizzle leftover glaze evenly over the top of the chicken breasts. Bake the chicken in the oven for 25 minutes. Switch the oven temperature to broil and cook the chicken an additional 5 minutes. Once finished, allow the chicken to cool for five minutes before serving. Broiling the chicken breasts adds a shiny appearance and crispy texture to the glaze. You can glaze a whole chicken by brushing the glaze directly onto the bird. Forgo the browning process and adjust the cooking time according to its size.